Hmmm . . . the tone here at Framed has ranged from despairing to sad over the last week. But leave it to PZ Myers to make my mood a little lighter. He posted a crank letter he received recently, and while the whole thing is a hoot, one sentence in particular is an absolute gem. As PZ says, "I'll never be able to write like that, not unless I take up a meth-and-steroid cocktail habit." It is just very difficult for me to follow the socially "hotpoint" controversies that tend to "crop up" in this forum in a genuine discussion of life system "origins" and what some might refer to as "darwanistically supported resolutions to the vast array of (just and ONLY JUST) humanly perceivable questions regarding the "chemicals to living ecosystems" splay of assertions that have historically (within the past decade or two) been (for understandable reasons up and to about 1959) been accepted as legitimate claims regarding how in the mighty unknown realm (you 20 to 90 and beyond if you are there, year old lovers of your masturbatorial philosphy) you could actually BELIEVE IN THESE RIDICULOUSLY OVERSTATED CLAIMS (UNDISCIPLINED IMAGINATIONS) TAKING INTO CONSIDERATION THE STUPIDLY INTERPRETED RESULTS OF POINTED INVESTIGATIONS THAT WERE SET UP FOR THE PURPOSE OF DEMOSTRATING THE VASTLY FAR FRICKING FETCHED PHILOSOPHICAL PREFERENCES OF THE "EXPERT" OVER THE PUBLIC, SELF PROCLAIMED MASTERS OF SCIENTIFIC KNOWLEDGE. Damn. Why don't I get letters like that? 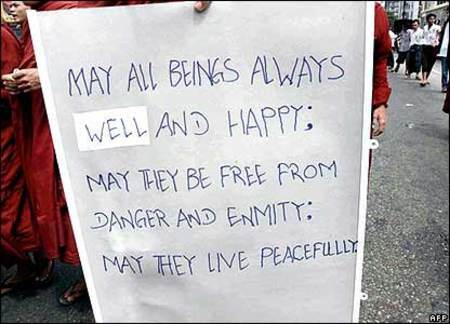 Security forces [in Mandalay] have restricted the movement of Buddhist monks and locked most of the monasteries, "effectively barring the Buddhist clergy from marching on the streets in protest, the report said, which CNN cannot independently confirm. In response, monks chanted words of "loving kindness," the report said. 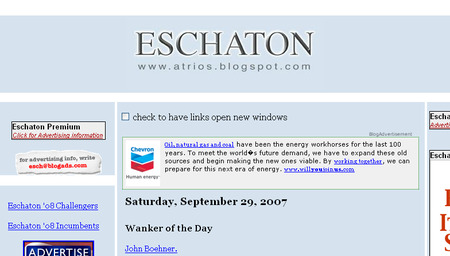 Why a Chevron ad on Eschaton? Why now? Couldn't Atrios get an ad from, I dunno, Blackwater instead? And so do the lives of the Burmese people. There is, however, something that those of us who live in the western world can do: pressure the corporations that do business with Burma and keep the military junta in funds. According to The Burma Campaign UK, those companies include Abercrombie & Kent, Chevron, Daewoo, Nippon Oil, Schlumberger, Siemens, Suzuki, and Total. Popular pressure on large corporations and the institutions which held their stock helped bring about an end to the apartheid regime in South Africa; a similar strategy might work in Burma. The foreground [of this photo] speaks for itself, but if you look at the upper left background, you'll see an advertisement for the movie 300. To my mind, 300 represents a juvenile, fantastical crusade for freedom from dictatorship. But unlike 300, most struggles against dictatorships and juntas during the last century have not involved smashing things, bellowing, and rippling abdominals, but ordinary people, who simply possess a dreadful hope that, despite all the murderous evidence to the contrary, human decency and the justice of which we can conceive will prevail over unethically-wielded might. Too often, this has not been the case, and there has been a dreadful and bloody price. Yet the people of Myanmar still march, only armed with the conviction that their government is unjust and that it can be changed through non-violent means. They are awe-inspiring and humbling, not only for their courage, but for their steadfast commitment to dignity in the face of indignity. Members of Khobar's Commission for the Promotion of Virtue and Prevention of Vice were the victims of an attack by two Saudi females, Asharq Al-Awsat can reveal. According to the head of the commission in Khobar, two girls pepper sprayed members of the commission after they had tried to offer them advice. Head of the Commission for the Promotion of Virtue and Prevention of Vice in the Eastern province Dr. Mohamed bin Marshood al-Marshood, told Asharq Al Awsat that two of the Commission's employees were verbally insulted and attacked by two inappropriately-dressed females, in the old market in Prince Bandar street, an area usually crowded with shoppers during the month of Ramadan. According to Dr. Al-Marshood, the two commission members approached the girls in order to "politely" advise and guide them regarding their inappropriate clothing. Consequently, the two girls started verbally abusing the commission members, which then lead [sic] to one of the girls pepper-spraying them in the face as the other girl filmed the incident on her mobile phone, while continuing to hurl insults at them. It was those wonderful folks from the Saudi "Commission for the Promotion of Virtue and Prevention of Vice" who, back in 2002, wouldn't let girls out of a burning middle school because they weren't draped in robes and scarves. 14 girls died and 50 were injured. Those two women are brave--not as brave as the Burmese monks, but still pretty gutsy. Can't wait for the cell phone video to be posted to YouTube. I hope next time they pepper spray the clothing police 14 times, one for each girl who was burned alive five years ago. 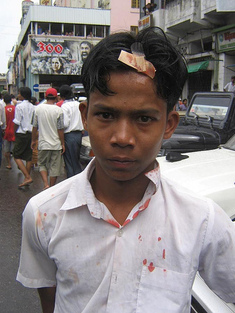 Blogging from London, Ko Htike has been documenting the brutal crushing of the Burmese people by the thugs who run the government there. He has been assisted by many brave people in country who, at considerable risk to themselves, have been forwarding him photos and accounts of the ugly events transpiring there. Meanwhile, the government has cut Burma's connection to the internet so that it can carry out its acts of brutality without the world watching. There is a lot more Democrats could do to change, or at least challenge, the politics of the war in Washington, even if they do not have the numbers to impose new policies on President Bush. House Speaker Nancy Pelosi (D-Calif.) could force a vote a day over Iraq. She could keep the House in session all night, over weekends and through planned vacations. Senate Majority Leader Harry Reid (D-Nev.) could let filibusters run from now till Christmas rather than yield to pro-war Republicans. Such tactics might or might not be politically sensible, but in their absence, anti-war lawmakers can hardly say they have done everything possible to challenge the war and bring attention to their cause. Instead, the Democrats are walking into a trap of Vietnamesque proportions. Come January 2008, they may well control congress and the presidency and be stuck fighting a war that a significant majority of Americans wants no part of. 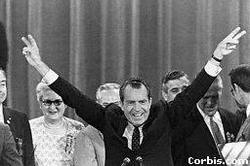 Then just watch how long it will take the GOP to gin up a "peace with honor" platform. And in the meantime, how many people die? That debt is estimated at $55 billion for the next 80 years. So G.M. will establish the trust with about 70 percent of that amount, making an upfront payment of cash, stock and other assets. The difference is expected to come from gains on investments by the trust. I mean, GM still has to put up the money, so how does this cut their costs? And if it turns out that the VEBA fund is grossly inadequate to cover health care costs in, say, the year 2027, then what is the recourse for GM retirees and employees? Yeah, I understand that by getting that obligation "off the books," GM's debt rating may improve, thereby saving the company some interest charges on money it borrows; in other words, this is essentially an accounting trick. I also understand that the union got some "guarantees" that GM will continue to operate its plants in the US; sounds kinda vague to me. Some analysts are arguing that some retiree health care funds under union control is better than no retiree health care funds if GM eventually goes bankrupt. But the truth of the matter is the UAW has accepted an under funded retiree health care package that will be a boon for GM and its investors, but might very well spell disaster for retirees in the future. GM has been let of the hook, and the union has taken on a tremendous burden. Increased co-pays and benefit reductions are a practical financial certainty. As Greg Shotwell of SOS points out, at least there are legal and contractual obligations with the retirees and GM under the current arrangement. It is a very dangerous gamble, with market forces, and talents and trustworthiness of UAW money managers playing a huge role in the success or failure of the plan. And if it fails, the workers will have the UAW to blame, and not GM. In other words, the union appears to be giving up its bargaining rights when it comes to setting future health benefit levels. If it turns out that the VEBA isn't covering workers and retirees adequately, what is the union to do? It can't address matters like co-pays, deductibles, coverage exclusions, caps and benefit limitations in future contract negotiations, because GM no longer is responsible for these matters. This country is in such desperate need of a real working class victory. After decades of being beaten down by declining real wages and benefits cuts – longer work days and less control over conditions of work– de-industrialization and corporate globalization – the U.S. working class is demoralized, degraded and disempowered. We need a break, a turning point, a line in the sand. We need a battle of Gettysburg & Vicksburg, of Midway & Stalingrad, in the class war that we are so badly losing right now. We need the UAW of the 1930’s sit-down strikes which checked the power of capital for decades. Or at least the UAW of the 1960’s with it’s commitment to social movements and civil rights. Instead what we got is the UAW of the 80’s and the 90’s, and one more in a long line of concessionary contracts. One more nail in the coffin of the U.S. industrial working class. Indeed. Somehow the more aggressive, confrontational spirit of the labor movement has been replaced with weary acquiescence. That's bad not only for unions and their members, but bad for democracy as well. Here is another reason why I just can't warm up to Hillary Clinton. Bush seems determined to boost her candidacy. His "advice" to her is so transparently self-serving that I can only believe that Senator Clinton is talking with him in order to appear more "Presidential." Talking to George W. Bush about what to do in Iraq is like talking to Osama bin Laden about what to do at the ground zero site.